Perhaps everybody does love Raymond (Williams), cultural theorist, border-crossing Welshman, television critic, elegant pipe smoker. 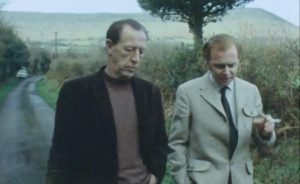 A special event during Birkbeck's Arts Week 2018, Landscapes of Culture: Raymond Williams Thirty Years On, depicted Williams across three separate television landscapes traversing 1970, 1979 and 1988, through the Welsh borders of his home, the class upheaval of Cambridge where he taught, and the country house of Tatton Hall, to its natural finale: a strangely lit television studio where his legacy was discussed by an ideologically unusual array of politicians, academics and writers. These three documentaries – rarely seen since their original terrestrial broadcasts – formed part of the London-wide archive television season Radical Broadcasts: Theory On TV, which I have curated with Dr Matthew Harle, an Associate Research Fellow of Birkbeck’s School of Arts. Our intention with this season was not simply to provide a series of snug, nostalgic broadcasts of complex ideas on vintage television but to open up questions around the role of public intellectuals and public service broadcasting: why did the commissioners at the BBC deem it important to give televisual space to such complex interlocutors of theory and criticism? And what could it actually mean to consume television during this period when your viewing options could be limited to a documentary on the meaning of culture in society or Match of the Day? Landscapes of Culture was the final screening in our inaugural run of Radical Broadcasts screenings. Our decision to host this at Birkbeck Arts Week was crucial – we were conscious of the enthusiasm for his work across the Department of English and Humanities (and beyond), verified by the sell-out nature of the screening. However, selling-out is a charge one could never level at Williams. His laconic and uncompromising mannerisms, often embellished by a series of astonishingly beige, to the point of almost anti-colour, turtlenecks, made Williams a reassuring and compelling television presence. In Border Country (1970), we witness Williams debating and walking these landscapes of culture with a pre-fame Dennis Potter acting as the effervescent postulant, with Williams the avuncular cultural confidant. We later catch Williams in a domestic setting, briefly setting down to type at his rather insular desk before stepping away to awkwardly recline and face the camera in his leather swivel chair, a strangely modish item amongst his sparse living room; indeed, one could never question Williams’ commitment to both aesthetic and domestic realism. The Country and the City (1979), helmed by the acclaimed television director Mike Dibb (who worked wonders on John Berger’s Ways of Seeing BBC series earlier in the decade), was a more stylish and dramatic depiction of Williams’ earlier book of the same title, compacted into an invigorating video essay on the historical entanglement of agriculture, urbanism and property in British culture and society, through the prisms of poetry, prose and painting. We also encounter Williams’ wife, Joy, for the first time as Dibb directs them through encounters with the settlements and place names investigated in the book. If we step out of the black box of the BIMI cinema screen and into the wider frame, the screening took on an entirely new perspective after the films as the cinema space appeared to re-position itself into the format of a late-night television discussion show from the 1990s. Dr Harle, perhaps adapting the role of a marginally more louche Anthony Barnett from the previous screening, hosted a lively discussion with Professor Esther Leslie and Dr Joseph Brooker. But perhaps the most surprising comment came from an audience member who, during a discussion of Williams’ relevance to the Left in present day Britain, revealed that the shadow Chancellor of the Exchequer, John McDonnell, quoted Williams at length to describe the ethical, institutional culture and values of the working class at Labour’s New Economics Conference earlier this year. As a finale to our Radical Broadcasts season, it was incredibly heartening to witness the BIMI cinema space entirely full for our Raymond Williams extravaganza. As Williams himself burrs at the end of one of the documentaries: “we have to decipher all the images that surround the country and city and to understand the real contradictions and connections that surround them.” And it is these contradictions and connections which form the basis of our Radical Broadcasts programme and fuel the sense of urgency which accompanied each screening. We are very grateful for the support of Birkbeck Arts Week and the Lorraine Lim Postgraduate Fund for providing support to develop and continue to make these ideals a present day reality. Colm McAuliffe is writing a doctoral thesis about the impact of continental theory in British culture.